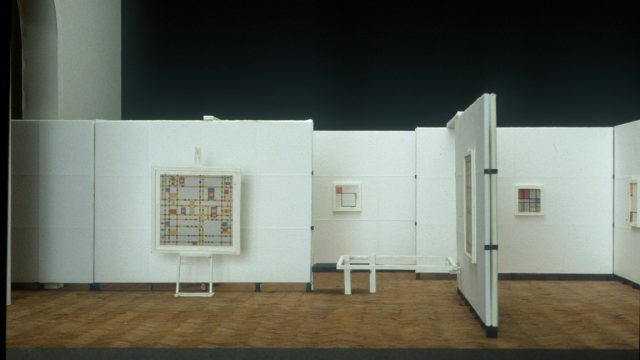 In 1956, the first exhibition in Italy entirely dedicated to Mondrian was inaugurated at the Galleria d’Arte Moderna in Rome. For this exhibition Carlo Scarpa did a project that oppose the monumentality of the spaces of the Valle Giulia Gallery through a rhythmic composition of orthogonal intersections of planes and pauses suggested by Mondrian’s “Composition in Line” from 1917. In the large central hall there were seventeen neoplastic masterpieces, including the “Broadway Boogie-Woogie” of 1943, placed on the white easel. 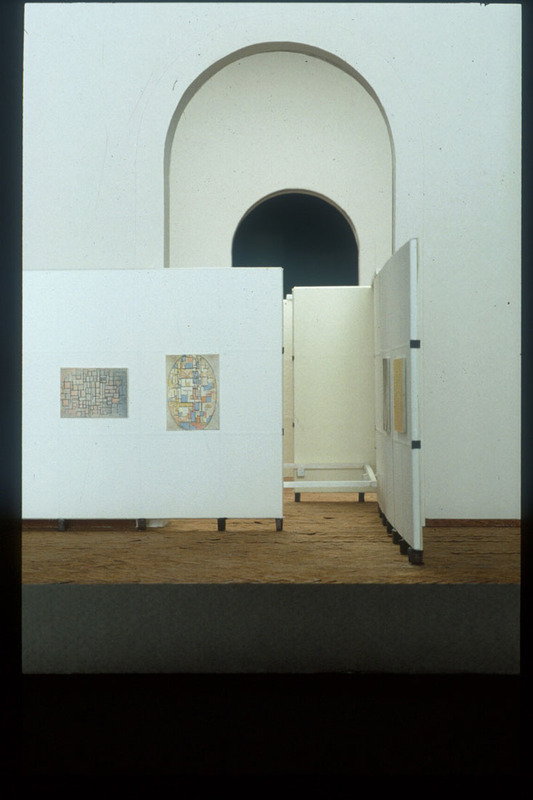 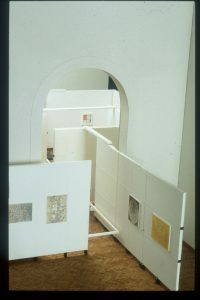 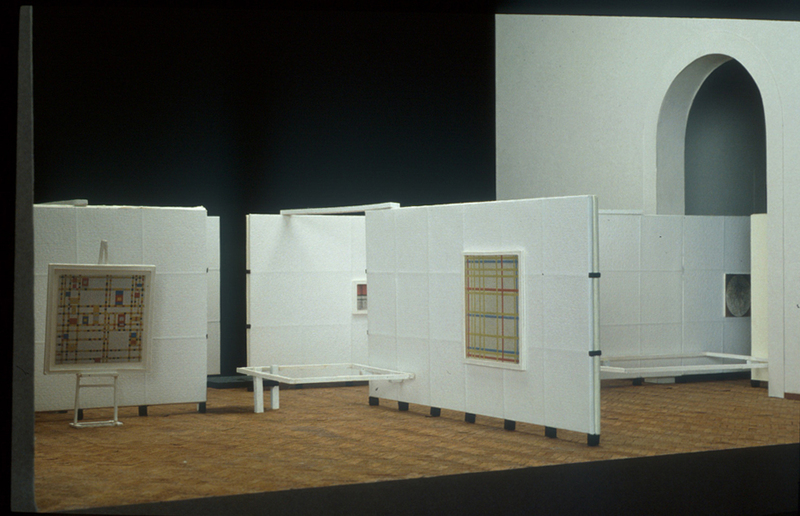 This masterpiece was placed on white easel, with which Scarpa wanted to make a symbolic and visual pivot of the exhibition opening perspectives that allow orthogonal or oblique perception. 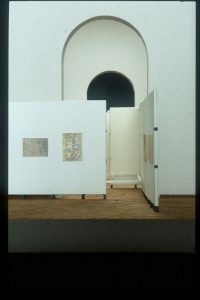 The other pictures were placed on modular panels made of rough canvas stretched on the looms and soaked in a mixture of lime and gypsum. 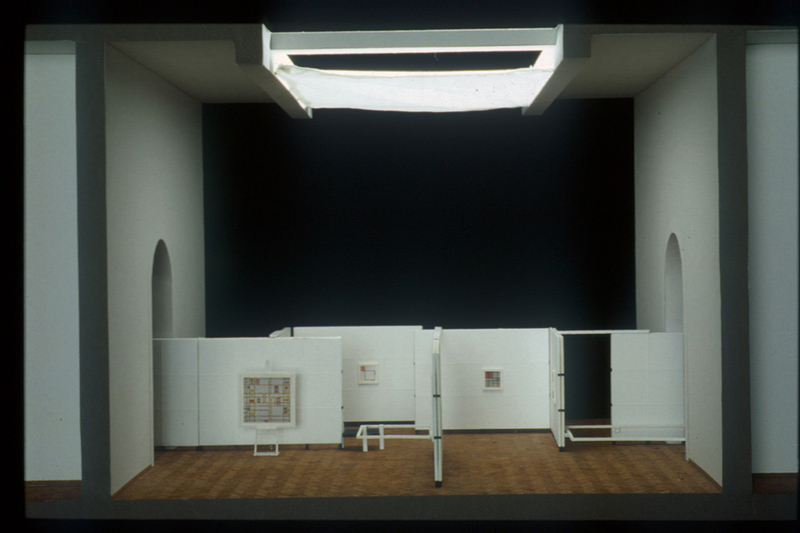 The zenithal light comes from nine skylights and it was attenuated thanks to the positioning of a thin canvas. In the set-up is recognised a recall of the Rietvield furniture design, consisting three wooden fences of different sizes. 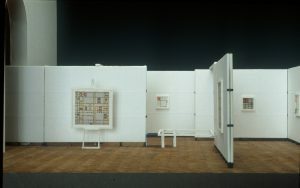 They are painted white in addition to make a connection with the panels. 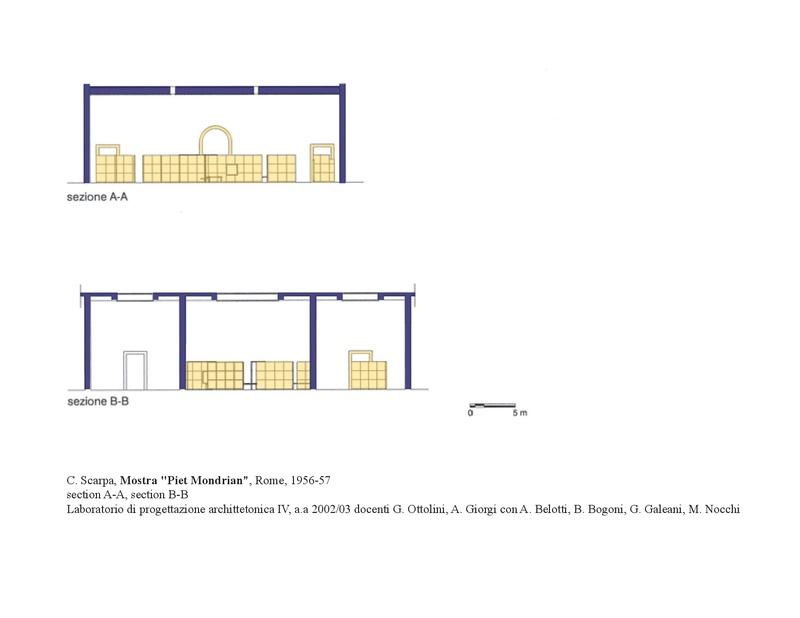 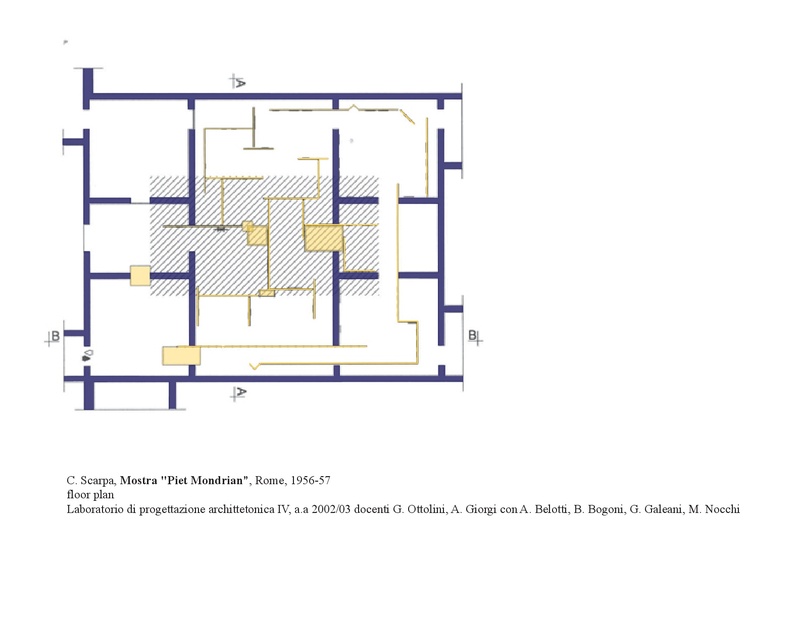 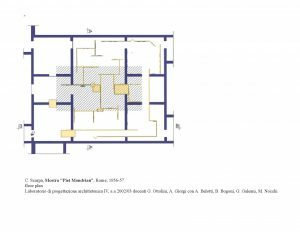 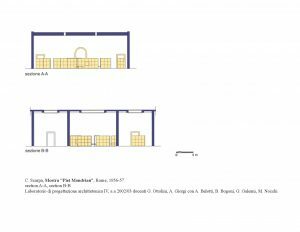 Carlo Scarpa, Exhibition “Piet Mondrian”, 1956-57, Drawings completed for Laboratorio di progettazione architettonica IV, Prof. G. Ottolini, A. Giorgi, con A. Belotti, B. Bogoni, G. Galleani, M. Nocchi, Politecnico di Milano, A.A. 2002-2003.